Background: Worldwide, finfish fisheries are receiving increasing assessment and regulation, slowly leading to more sustainable exploitation and rebuilding. In their wake, invertebrate fisheries are rapidly expanding with little scientific scrutiny despite increasing socio-economic importance. Methods and Findings: We provide the first global evaluation of the trends, drivers, and population and ecosystem consequences of invertebrate fisheries based on a global catch database in combination with taxa-specific reviews. We also develop new methodologies to quantify temporal and spatial trends in resource status and fishery development. Since 1950, global invertebrate catches have increased 6-fold with 1.5 times more countries fishing and double the taxa reported. By 2004, 34% of invertebrate fisheries were over-exploited, collapsed, or closed. New fisheries have developed increasingly rapidly, with a decrease of 6 years (±3 years) in time to peak from the 1950s to 1990s. Moreover, some fisheries have expanded further and further away from their driving market, encompassing a global fishery by the 1990s. 71% of taxa (53% of catches) are harvested with habitat-destructive gear, and many provide important ecosystem functions including habitat, filtration, and grazing. 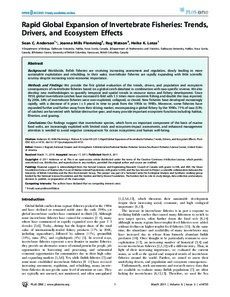 Conclusions: Our findings suggest that invertebrate species, which form an important component of the basis of marine food webs, are increasingly exploited with limited stock and ecosystem-impact assessments, and enhanced management attention is needed to avoid negative consequences for ocean ecosystems and human well-being.